Pulled roast chicken in a creamy sauce with Pancetta and Mature Emmental cheese, topped with roasted potatoes. Chicken with garlic & nutmeg cured pancetta in a white wine sauce, topped with nutty Emmental cheese. Succulent roast chicken is paired with spiced pancetta, expertly cured for us in Italy using fragrant garlic, nutmeg and spicy white pepper. White wine lightens the rich cream sauce, while golden roast potatoes topped with mature Emmental add an irresistible crunch. 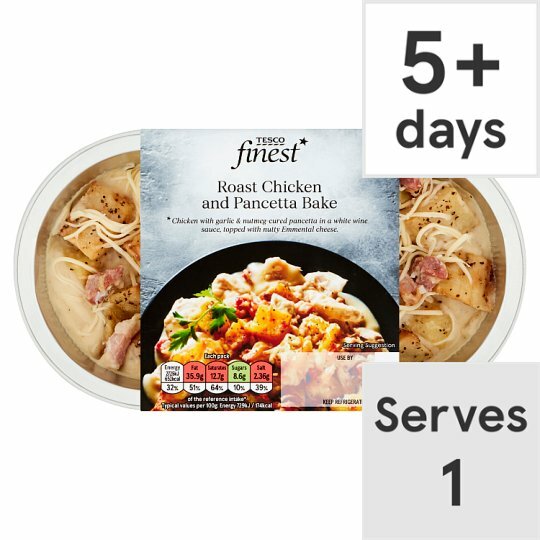 Roast Potato, Chicken (21%), Cream (Milk), Onion, White Wine, Pancetta (3.5%), Emmental Medium Fat Hard Cheese (Milk), Rapeseed Oil, Chicken Extract, Water, Cornflour, Wheat Flour (Wheat Flour, Calcium Carbonate, Iron, Niacin, Thiamin), Sugar, Salt, Rosemary, Bay Leaf. Roast Potato contains: Potato, Rapeseed Oil, Sea Salt, Black Pepper. Pancetta contains: Pork Belly, Salt, Spices, Curing Salts (Sodium Nitrite, Potassium Nitrate), Dextrose, Coriander, Garlic. Instructions: From Chilled: 190°C/ Fan 170°C/ Gas 5 25-30mins. Place on a baking tray in the centre of a pre-heated oven for 25-30 minutes. Leave to stand for 1 minute after heating. Instructions: From Frozen: 190°C/ Fan 170°C/ Gas 5 40-45mins. Place on a baking tray in the centre of a pre-heated oven for 40-45 minutes. Leave to stand for 1 minute after heating. Caution: Although every care has been taken to remove bones, some may remain.